The below artworks are the most important by Dante Gabriel Rossetti - that both overview the major creative periods, and highlight the greatest achievements by the artist. Artwork description & Analysis: The Girlhood of Mary Virgin was arguably Rossetti's first mature painting. Completed the year after he had cofounded the Pre-Raphaelite Brotherhood (in 1848) Rossetti intended to show the painting that spring at the Free Exhibition at the Hyde Park Corner Gallery. The canvas shows the young Virgin Mary seated at a table with her mother, Anne, as the two embroider a lily. In the background, Mary's Father, Joachim, reaches to prune a vine in a luscious green garden which has been visited by a haloed dove. At the women's feet are a crossed palm branch and thorn. On the left hand side of the picture frame is a child angel who waters a vase with the prop of the lily. The flower rests on a stack of educational books labelled: Charity, Faithfulness, Hope, Prudence, Temperance, and Fortitude. 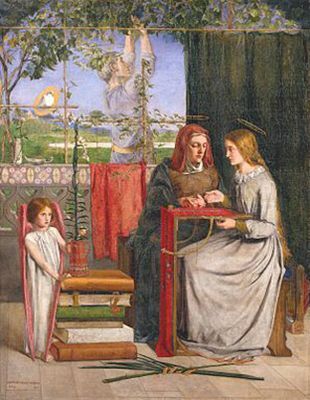 Artwork description & Analysis: The year after his "reimagining" of the childhood of the Virgin Mary, Rossetti chose to continue his vein of religious scenes by painting the Annunciation; the moment where the Angel Gabriel appeared to the Virgin bringing news of her divine pregnancy. The Latin title quotes the Gospel of St Luke, translated as "Behold the handmaiden of the Lord." 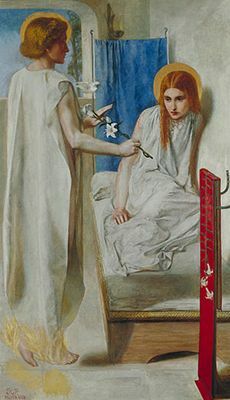 Rossetti creates a symbolic consistency by continuing the depiction of the Virgin Mary alongside lilies which were often used as a symbol of purity in Italian Renaissance and Medieval art. Here, indeed, Gabriel presents Mary with the lily as a symbol of her eternal virginity and purity. Both Mary and Gabriel are swathed in virginal white robes with golden haloes, and backed with the rich royal, heavenly blue typically associated with Mary. A rich red panel stands in her bedroom, also with a decorative lily motif. 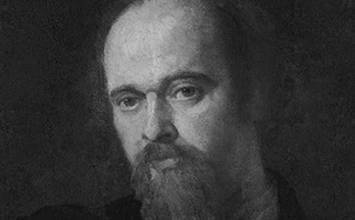 Artwork description & Analysis: By the time he completed Bocca Baciata (in 1859), Rossetti had been in a nine year relationship with Elizabeth Siddal. In that time he produced dozens of adoring sketches of his future wife (they were married in 1860). 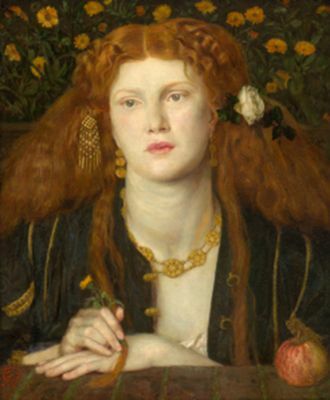 However, the model for this, the first of his painted female portraits, was not Elizabeth, but his mistress, Fanny Cornforth. Whereas he sketched Elizabeth as a beautiful, ethereal being, Rossetti painted Fanny as his ideal of sensual desire and allure. 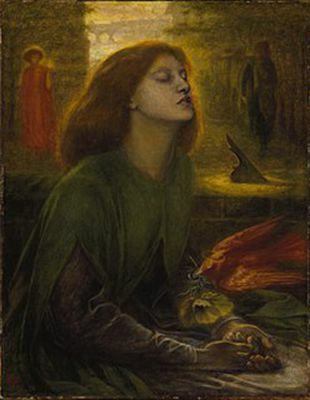 Artwork description & Analysis: By 1862, Rossetti had become disassociated with the original Pre-Raphaelite Brotherhood, and formed closer working bonds with William Morris and Edward Burne Jones both of whom appreciated Rossetti's aesthetic sensibilities and his dedication to medieval myth and legend. Rossetti was a founding member in Morris, Marshall, Faulkner & Co in 1861, and in the ensuing years he worked with the company on its decorative art designs. 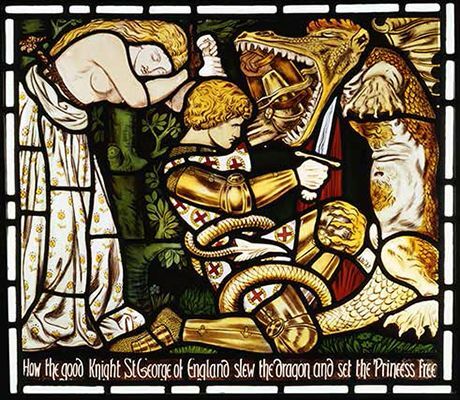 In 1862 he designed six stained glass panels for the windows at Harden Hall, West Yorkshire relating to the legend of St George and the Dragon (a rare excursion into British medieval history). The Morris & Co company became well known for their complex and vivacious designs, and Rossetti boasted that "Our stained glass may challenge any other firm to approach it." Artwork description & Analysis: There is a story about Rossetti that tells how, immediately following the death of his beloved Lizzie, the artist felt a sudden compulsion to create a funerary painting in her honor. This is true to an extent, but Rossetti actually reworked the material of an unfinished portrait into a new composition that became his eulogy to his wife. 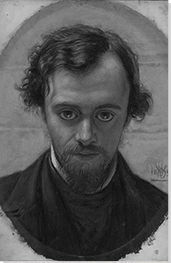 Artwork description & Analysis: By 1874, Rossetti was in the grip of a mental breakdown, a decline not helped by an addiction to chloral hydrate and alcohol. Still residing at 16 Cheyne Walk, he was nursed in the last ten years of his life by Fanny Cornforth, and visited regularly by his lover, Jane Morris. Rossetti had become somewhat obsessed with Morris in fact; the one woman he never fully possessed due to her unhappy marriage to William Morris (with whom, it is said, she stayed married for the sake of their children). However, during 1870s, Rossetti painted many portraits with Jane as his model. Here, with her ruby red lips, thick raven hair, elongated neck, and dressed in a flowing blue silk gown, she is the very picture of elegance. However, though she possess a serene beauty, her expression is distant and she seems somewhat forlorn.